Seventeen NHS hospitals are among 26 healthcare providers in England failing to operate with safe staffing levels, the Care Quality Commission has said. The health watchdog issued the hospitals with warnings in November, after carrying out inspections. About 16% of hospitals failed to come up to the necessary level. Labour said the findings reflected a "toxic" combination of reorganisation and cuts, but ministers said the number of clinical staff had risen since 2010. Late last year the commission highlighted staffing problems in NHS hospitals in its review of services. This list gives further details about those findings. The 17 hospitals are listed in the Sunday Telegraph. They are named as: Scarborough Hospital; Milton Keynes Hospital; Royal Cornwall Hospital; Walton Centre NHS Foundation Trust in Liverpool; Queen's Hospital, Romford; Stamford & Rutland Hospital; Southampton General Hospital; Croydon University Hospital; Bodmin Hospital; Northampton General Hospital; St Peter's Hospital, Maldon; Queen Mary's Hospital, London; Chase Farm Hospital, London; Westmorland General Hospital, Cumbria; Pilgrim Hospital, Lincolnshire; St Anne's House, East Sussex; and Princess Royal Hospital, West Sussex. Also named is the London Ambulance Service and eight mental health trusts. They are: Ainslie and Highams Inpatient Facility, London; Campbell Centre, Bedford; Forston Clinic, Dorset; Cavell Centre, Peterborough; Bradgate Mental Health Unit, Leicestershire; Avon and Wiltshire NHS Mental Health Trust; Blackberry Hill Hospital, Bristol; and Park House, Manchester. A spokesman for the CQC said it had told the hospitals they must comply with its standards, and show how they were going to achieve this. 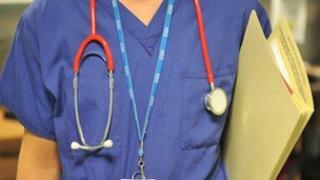 Health Secretary Jeremy Hunt said he expected "swift action" to be taken by those named. "There can be no excuse for not providing appropriate staff levels when across the NHS generally there are now more clinical staff working than there were in May 2010 - including nearly 5,000 more doctors and almost 900 extra midwives," he said. "Nursing leaders have been very clear that hospitals should publish staffing levels and the evidence to support them twice a year. "We fully support this and will put an extra £12.5 billion into the health service by 2015." Media captionMike Farrar, NHS Confederation: "I'm absolutely convinced that the hospitals in these cases will have taken swift action"
Mike Farrar, chief executive of the NHS Confederation, which represents managers, said he was "absolutely convinced that the hospitals in these cases will have taken swift action to improve the levels of service and indeed the levels of staffing on those wards". Labour - which released the information - points out that nursing numbers in England are down nearly 7,000 since the coalition came to power. It says providers could not provide the standards of care everyone wanted to see if they were overstretched. Shadow health secretary Andy Burnham said: "The government is doing its best to lay the blame for the ills of the NHS at the door of the nursing profession. But nurses will not be able to provide the standards of care we all want to see when they are so overstretched and the wards so short-staffed." And Labour leader Ed Miliband told the BBC's Andrew Marr programme that the figures were a "shocking set of findings". He added: "The government's got to explain what's happening in our hospitals, why this is being allowed to happen. It's got to take action to do something about it." Two of the hospitals named have so far taken issue with the report. The Walton Centre said it had a very high staff to patient ratio and a negative rating based on a snapshot observation was "incorrect and unfair". Its medical director, Peter Enevoldson said: "Patient safety is our most important concern and we are proud of the excellent care that we provide to patients, with a better staff to patient ratio than most other NHS trusts in the country." The Bradgate Unit said patient safety was its upmost priority and the Care Quality Commission had been satisfied by its ward staffing levels after a routine inspection in October. Chief Executive John Short said: "The temporary absence of non-nursing therapeutic staff when the CQC conducted its inspection did not and does not relate to patient safety, but would enhance patient experience. We are taking action to respond to the inspection by improving the availability of therapeutic activities and have now recruited specialist workers to do this."